Nvidia unveiled its new graphics-card lineup GeForce RTX series in August, which improves the gaming experience through new features. But those new features aren’t yet available because games supporting the high-end graphics cards aren’t out until 2019. The timing causes a huge risk in Nvidia’s chip transition period, RBC says. Watch Nvidia trade in real time here. 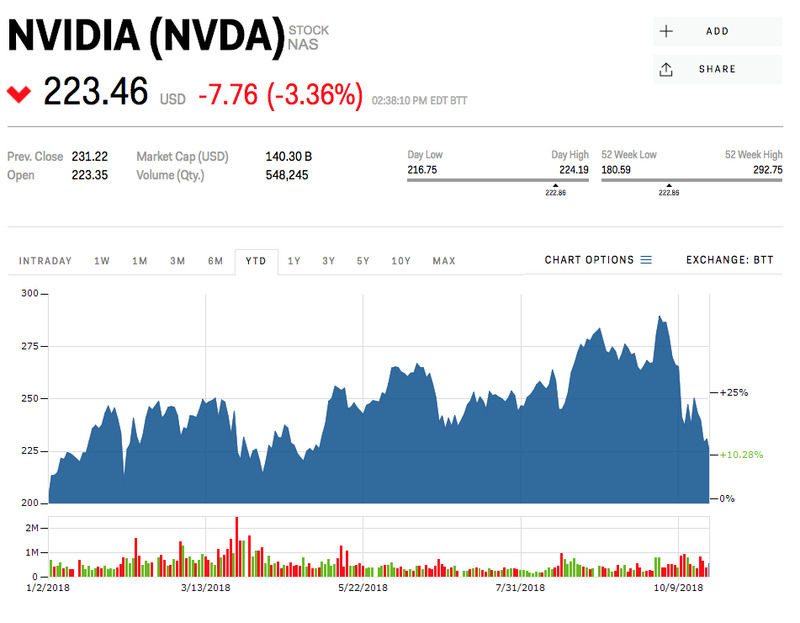 Wall Street analysts have ignored a major uncertainty in Nvidia’s gaming business- a timing risk of its chip transition period, UBS says. “Although we are bullish on Turing’s longer-term growth potential, our new deep-dive suggests the gaming ramp may be more elongated than the Street expects,” UBS analyst Timothy Arcuri said in a note sent out to clients on Monday. In August, the chipmaker unveiled its newest and fastest graphics cards, GeForce RTX series, which are powered by the company’s new Turing graphics-processing-unit architecture. Thanks to Turing’s better performance than its predecessor, Pascal, these graphics cards are able to improve the gaming experience through features such as real-time ray tracing, a rendering technology that allows for more cinematic and realistic visual and Deep Learning Super Sampling, a technology helps to improve image quality. While these feature sound exciting, they are not available right now because software supporting the high-end graphics cards is still not out yet. According to UBS, games that use ray tracing will not be released until 2019 – so consumers have no reason to upgrade their chips to the RTX version before these games are on market. “Barring Nvidia bringing ray tracing into the mainstream segment of the market and down the entire stack, RTX is only attractive for the very high-end of the market,” Arcuri said. “In the absence of these new games, the generation-to-generation performance boost of Turing versus Pascal, ignoring ray tracing and DLSS, appears to be less attractive than Pascal based on the gaming hardware websites we reviewed,” he added. Arcuri thinks Nvidia is in the process of launching new low-tier RTX graphics cards that will become available in 2019, meaning Nvidia’s gaming-segment revenue is highly reliant on the around 70 million users who are still on Maxwell/Kepler, Nvidia’s previous versions of microarchitecture, to upgrade to Pascal. So the bottom line is that from now until 2019 Nvidia needs consumers to buy its new chips, Arcuri said. To reflect this, Arcuri slashed his price target for Nvidia to $US260 from $US285, still 17% above where shares are currently trading. His note sent Nvidia shares down 4% on Tuesday. Nvidia stock was up 10% this year.